Afternoon everyone! Today I have an "indie polish" to show you, from one of my favorite people, Chelsea of Pretty and Polished! Chelsea is a total sweetie and she makes some great polishes that she sells in her Etsy store. Her polishes are really taking off so start stalking her shop! This is one of my favorite P&P polishes - a light pink jelly base with small and large black glitter! It's a really unique look. This is three coats to build the pink base and I love the depth it gives with the different layers of submerged glitter. 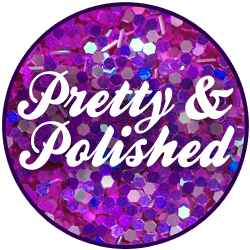 Pretty and Polished's prices are really reasonable - $8 for a full size and $4.50 for a mini. This one is not in stock right now but it should be back soon! I have two more P&P shades to show you in the future so keep an eye out for those! Beautiful Polish. Love the name! This is super pretty! And unique too. it looks so pretty and unique! Never heard about this one before but it's very very beautiful! topbox feature on yours truly!